Thought I'd do a review of the Savic Plaza, seeing as nobody else has yet. The stated dimensions for it are: 100cm X 50cm X 50cm, with a bar spacing of 9.5mm. However, my measurements were a little different, though please be aware that they could be inaccurate. I made the internal measurements nearer 97cm long X 46.5cm wide X 48cm tall. This still makes it big enough to fit a good number of toys and a large 12 inch wheel. The base is 16cm tall, so in theory that is the maximum depth of substrate you could get in. I measured the bar spacing at 1cm apart. What made me buy the Plaza in particular, was its large front opening door. This makes it somewhat of a unicorn among cages, as most seem to have very small doors. 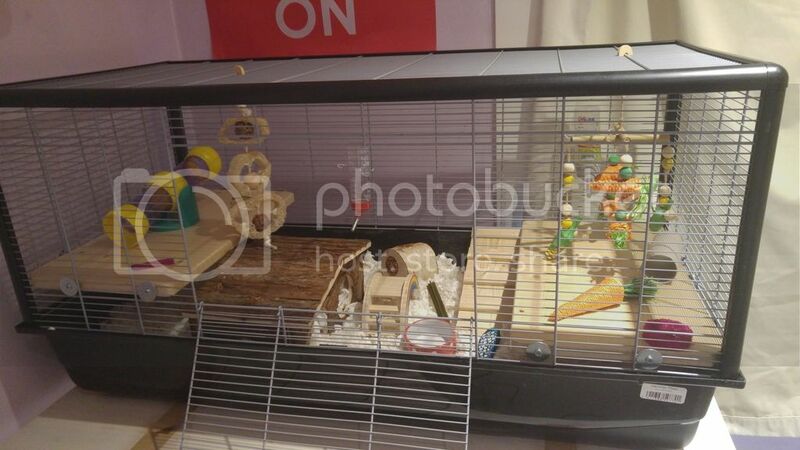 The measurements for the door are 38cm X 22cm, so it provides easy access to most of the cage. The door does have a fault, however. It is very difficult to open and close. Every time you do so, the paint is worn off the bars at the top of the door. Be warned if you have a skittish hamster, opening and closing the door will make a loud noise. On the plus side, this also makes it nigh on impossible for a hamster to push the door open from the inside. No more padlocks or bulldog clips required! The plastic platform and ramp which the Plaza comes with are not great. You will probably want to buy or make different platforms. This will, of course, add to the cost of an already expensive cage. You're not going to be able to find the Plaza for under 75 pounds (including shipping costs). For that amount of money, you can buy many other cages of the same size. You could even have the Alexander, which, of course, comes equipped with good platforms. But, what you are paying for with the Plaza, really is that big door which is its USP that those other cages just don't have. The above platforms are 45.72cm wide and 25cm deep. They fit well in the cage and are a good depth to help minimise open space. However, the design of the corners of the Plaza makes adding shelving difficult. Holding the wire side panels of the cage together at each corner, is a black plastic pole which juts out into the cage slightly, preventing the cage from having 90 degree corners. So, you will have to cut the corners off the two edges of the platform which sit in the corners of the cage. You can see this in the picture below. Obviously, don't forget to sand after cutting off the corners! And, you'll probably want to plastikote the platforms too - or use hemp mats. Finally, I should add that I found this cage was incredibly difficult to put together! Getting one wire panel to slide into a plastic corner piece, without another falling out, was so frustrating. That could just be me, though. Overall, I think it's a great cage. Obviously, it's not perfect, but it's as near to my idea of a perfect cage as I could find. It is also aesthetically pleasing and very robust - you can pick up the whole top section without the panels falling apart, as occurs with the Alaska. Here's how I set up the Plaza for Quigley when he first came home. Since then, I've made adjustments to the platform height, substrate depth and moved a number if the toys to prevent falling hazards. But, it should give you an idea of what you can do with the space. Please note, I got Quigley at 6 weeks old and was told that he should not have a wheel in his cage until he is 8-9 weeks old. The space at the back is where the wheel will go. Last edited by souffle; 01-10-2019 at 10:37 AM. That looks lovely. I saw it on zoobio for just over 74.00 pounds, including postage. Those shelves look really strong and good quality as well. I got it from Zoobio. It was €99.11, including postage, which worked out as £86.71. Price must have gone down since then... Or the exchange rate has gotten worse! Yep, the shelves are great. As I said, they require a bit of DIY on the corners to make them fit the Savic's awkward shape. But, well worth the effort. Nice review AP, I would agree with everything you said. I found the front door really stiff to open too but it's loosened a little bit now but it is still really tight. BorisPasha glad you like the review I can confirm that the wooden shelves I’ve used are really secure. They’re not in any danger of wobbling or falling, despite being thick. So, if you ever do want to use the cage I do recommend them. Good review - the cage looks lovely as well. To be honest, this is my dream barred cage due to the wonderful door. I did see the cage somewhere without all the shelves and accessories which was cheaper so that be a better option to buy if you prefer your own set ups. I will see if I can dig up the link and attach on this thread. chesca wish I’d found the cage without all the extra bits! The only accessory I have used that it came with is the bottle because I like to offer two drinking bottles just in case one breaks. Great review April Pearl - thank you! Answered all my questions. I think all doors clang somewhat when they are closed, and my other Savic cage had a door that closed tightly and pulled at the paint too - but as you say, it's secure. My dream cage too! 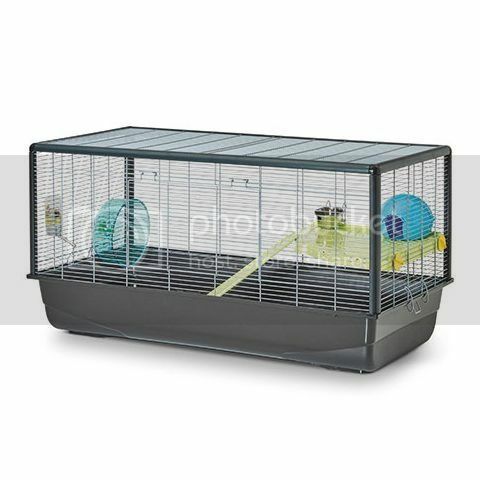 I actually wrote to Savic about 18 months ago and asked them to make a 100cm hamster cage with a big front opening door like the Hamster Heaven - and they kept me up to date about it! You got one and I didn't lol. 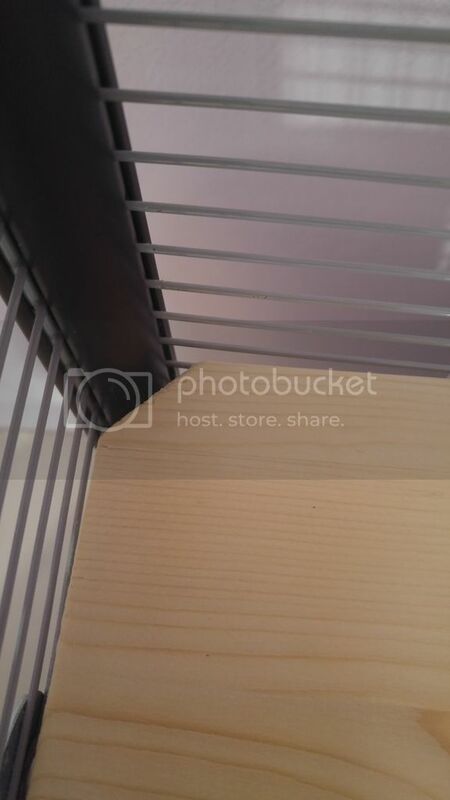 Congratulations on being the first to review this great cage! I had asked them to make it with 7mm bar spacing and a 30cm deep base lol. They did say they couldn't make a base that deep as it wouldn't be economical to set up new machinery. Bar spacing and height weren't confirmed at the time. They were maybe planning to do it anyway ha ha. Now it's less than £100 to buy I think it's a good option. The platforms look great - shame about the corners - you've done a neat job on them though. Serendipity in that case, I have you to thank for the creation of this cage! Hope you can get one if you’d like one, though I appreciate the bar spacing is problematic. So annoying that they ignored the one stipulation that was the most important to you! Maybe they will make one with 7mm spacing in future? The cage looks really lovely AP, I find that too at times, about not using all the accessories that come with cages. Why can't they just sell the cage alone?